SAN DIEGO ― More than 400 guests filled the Joe & Vi Jacobs Center for the San Diego Press Club’s Annual Excellence in Journalism Awards, Oct. 24. The awards ceremony honored distinguished journalism in broadcast, print and online. The Log was a recipient of four awards being recognized for four different articles published online and in print. 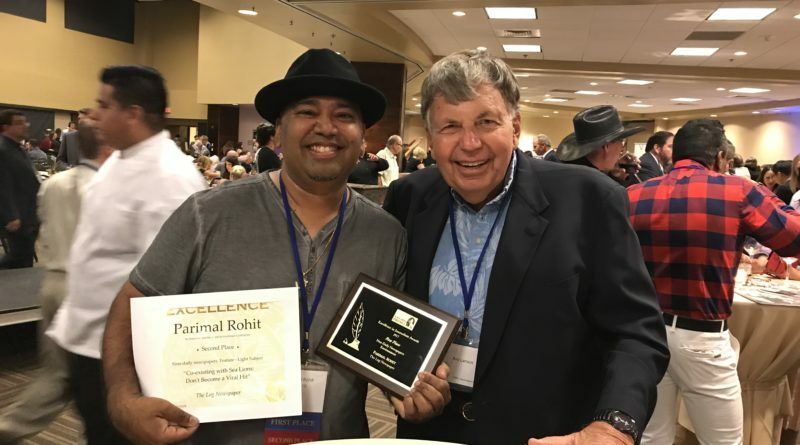 The Log’s Managing Editor Parimal M. Rohit won “Best Environment Story” for an article he wrote on sea level rise. The article can be viewed at bit.ly/2i4rbJg. Rohit also placed second for a “Light Feature Story” about respecting marine mammals. The story can be read at bit.ly/2xmTdGi. Capt. Nicole Sours, The Log’s Dock Lines author, received second place in the category of “Essay/Opinion/Commentary,” for an article she wrote about the hazards of ethanol in marine fuel. Her article can be seen online at bit.ly/2xm9s6n. Sours was also awarded third place for a “Light Column Story” memorializing her beloved boat cat. The article is online at bit.ly/2yKiAFO. Journalists submit work to be considered for various categories in the competition. The San Diego Press Club split categories this year, such as columns and features into “Serious” and “Light,” due to the growing number of submissions. A list of all the award recipients can be viewed online at bit.ly/2y6O0Sm.